Officials say that Houston air is still okay to breathe. Despite the massive plume of inky black smoke that has been drifting across Houston since a fire broke out two days ago at a petrochemical plant in Deer Park, both local and state authorities continue to maintain that there is no need to be concerned about air quality in and around the Houston area. This is not because the chemical-laced smoke coming off the fire at Intercontinental Terminals Company’s Deer Park plant is completely harmless—nearby residents and workers have been complaining of scratchy throats and burning eyes, according to the Texas Tribune—but simply a matter of luck since the plume stretching farther and farther across the city has remained too high in the air to bother most people on the ground, according to monitoring conducted by the Texas Commission on Environmental Quality, the state agency charged with overseeing environmental regulations. Some might be raising their eyebrows at TCEQ reassurances given their recent track record on monitoring air quality—many still haven’t forgotten the lapses of the agency during Hurricane Harvey when huge amounts of chemicals were released from Houston’s refinery row—but so far Harris County Public Health officials have also taken this stance. The plume is rising, on average, about 3,000 to 4,000 meters above ground level right now, and even though it sank Monday evening to between 300 to 400 feet above ground, officials say it will only affect Houstonians if it sinks all the way down to the ground, according to KUHF. The county's environmental agency has warned that while the air should be safe enough while we wait for the fire to burn itself out, anyone who begins to feel symptoms like coughing, difficulty breathing, burning and irritation to the eyes, nose and throat, headaches, nausea, or dizziness should consult their doctor. 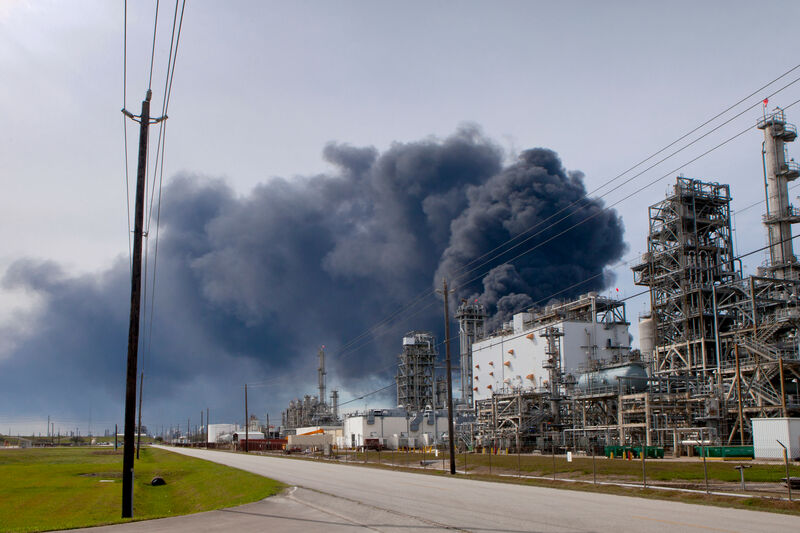 The smoke being belched into the sky just 15 miles southeast of Houston is coming from some truly noxious chemicals. The fire started Sunday in two tanks that contained naphtha and xylene, respectively, and spread to six other tanks by Monday morning, according to a release from ITC. While firefighters had put out the flames in two of the tanks by the end of yesterday, a dip in water pressure overnight allowed the fires to resurge in both tanks, so that eight are still belching smoke as of this morning. Most of the chemicals involved in the fire are used to produce gasoline and base oil, a machinery lubricant, though one of the tanks that caught fire on Monday was holding gallons of toluene, a chemical used in nail polish remover. By mid-Tuesday morning five tanks were still on fire, officials stated in a press conference.